3-0 victory lifted them back to the top of the table. who sank even deeper into relegation trouble. they will stay there if Chelsea lose to City. vital 2-1 victory at fellow strugglers Southampton. Days after it was confirmed that the body of Emiliano Sala, the club’s new signing from Nantes, had been recovered from a plane that vanished over the English Channel, Cardiff were boosted by Kenneth Zohore’s last-gasp winner which lifted the Welsh club out of the bottom three. Arsenal maintained their top-four push with a 2-1 victory at rock-bottom Huddersfield Town, their first away win in the league since November secured by goals from Alex Iwobi and Alexandre Lacazette. The problems mounted for Everton manager Marco Silva as his side went down 1-0 to his old club Watford at Vicarage Road and had defender Kurt Zouma sent off in stoppage time. West Ham United who had led through Mark Noble’s penalty. finish the weekend in the relegation zone. Poor performances in draws against Leicester and West Ham, results which allowed Man City to eradicate their lead, had raised questions about Liverpool’s nerve as they chase a first English title since 1990. PEP I know what happened to the Champions for the last five or six years..
That is what has delighted me to the most this season. We want to be there until the end and Sunday could help us. good link-up play with Roberto Firmino. Sunday, a little further back on 57 points. previous two games and struggled a bit with set-pieces,” Klopp said. outstanding performances on the pitch. 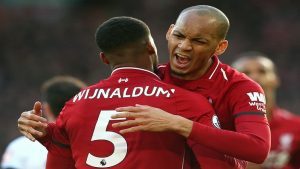 The post Liverpool cruise back to the summit, United surge on appeared first on SABC News – Breaking news, special reports, world, business, sport coverage of all South African current events. Africa's news leader..